Materials: Worsted weight yarn of your choice. Size F (3.75 mm) hook or size needed to produce a tight, stuffable fabric in single crochet. Polyester fiberfill or other stuffing material sufficient to stuff creature firmly. Buttons, felt, and/or contrasting yarn for eye and mouth. sc2tog: Insert hook through both loops of next sc, yo and pull through, insert hook through both loops of next sc, yo and pull through, yo and pull through all 3 loops on the hook: 1 sc2tog (counts as 1 sc). You may prefer to start your creature with a method other than the chain four/join to form ring stated. Alternate methods I’m aware of are to start with a chain two and work the first round’s single crochets into the second chain from the hook, and the magic ring method described at CrochetMe (http://crochetme.com/amigurumi-double-ring). Use whatever technique allows you to have the smallest (or, preferably, non-existent!) hole at the beginning of the work. The main body of this piece is worked in spirals. Do not join rounds. Each increasing or decreasing round features 6 repeats of the increase or decrease stitch pattern. You may find it useful to mark the first stitch of each round. This pattern can be worked with any weight yarn and an appropriate hook…bigger yarn/hook will produce a bigger piece. As written, the finished creature is approximately 4.75 inches (12 cm) tall. To change colors in sc, insert hook through both loops of next sc and yo with old color, pull through (2 loops on hook), then yo with new color and pull through both loops on hook. Round 32: Sl st around as needed to close gap, fasten off and weave in end. Round 1: Ch 3, 11 dc in ring. (12 dc) Join with sl st to top of ch 3. Repeat from * to * around, ending with sl st in same sp as last sl st of previous round. Fasten off, leaving a long end to sew tentacles to body. Sew the tentacles to the body. off, leaving a long end to sew eye to body. a long end to sew eye together. 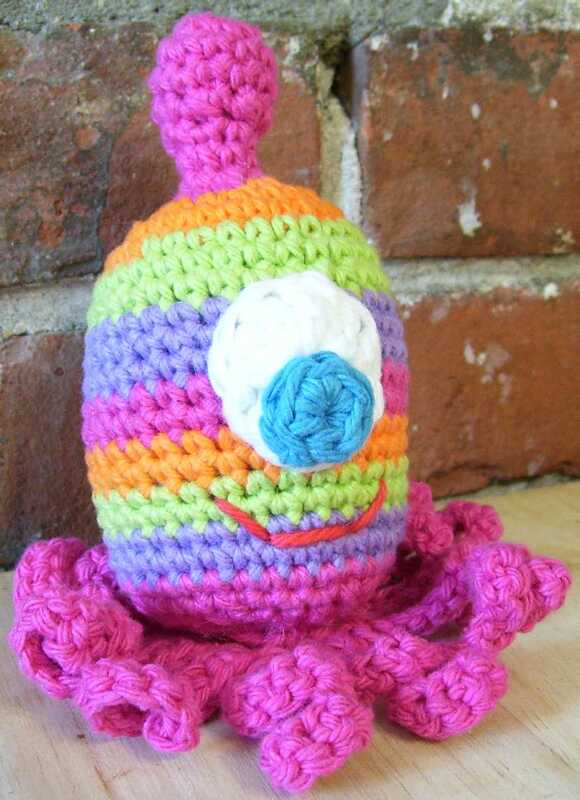 The One (Eyed) Little Alien crochet pattern is Copyright 2007 by Deborah Ellis. Please do not reproduce this pattern in whole or in part. Please feel free, however, to sell any items that you make from this pattern. If you have any questions at all, please contact the author at neatlytangled@gmail.com. Thank you.